Welsh sprint athlete Jamie Baulch has represented Wales and Great Britain for over ten years. Winning a gold medal in the 4x100m at the World Juniors in 1992, Jamie made his first senior team by representing Wales at the Commonwealth Games in 1994. His breakthrough year came in 1996 when at the Atlanta Olympics he won a silver medal in the 4x400m. Though he won several outdoor medals via the World Championships, European Championships and Commonwealths Games, it was the indoors where Jamie excelled. 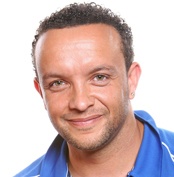 Jamie found himself as a World Champion in the 400m in 1999, as well as receiving bronze in 2001. In January 2010 it was announced that Baulch and his 4x400m relay teammates would be awarded gold for their performance in the 1997 World Championships due to America being disqualified. Baulch can often be seen on TV appearing on A Question of Sport and in 2003 came third in the BBC Superstars event.